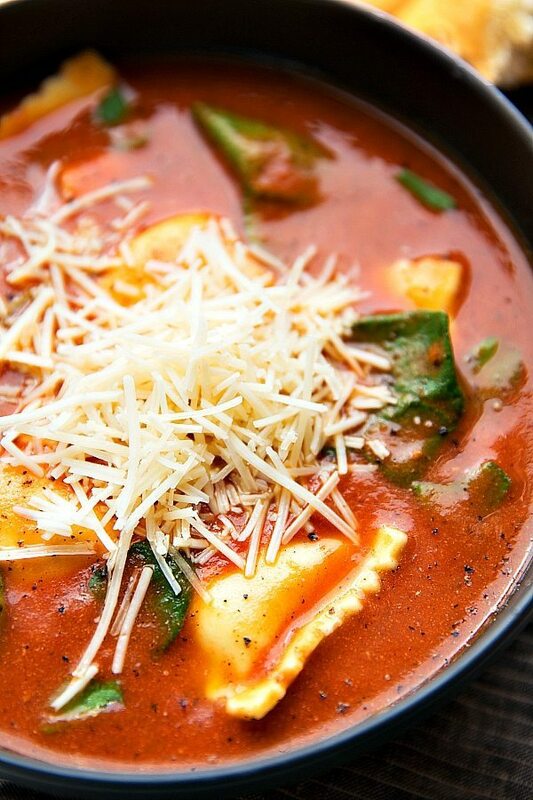 A simple tomato-basil soup made in the slow cooker with cheese-filled ravioli, spinach, and Parmesan cheese. As you can probably imagine with running a food blog we have a lot of leftovers at my home! I’ll generally work through a recipe several times before I’m ready to share it with you all and with only 3 eaters we’ll usually eat a meal for several days. This soup, however, has disappeared the same day (or next afternoon at the latest) every time I’ve made it. I know I’ve told you all how much my 2 year old loves salad (especially this one! ), but I think this soup is his new favorite meal. Ever. I had no idea he liked ravioli (how have I never made it for him?!) but he is absolutely crazy about it! And as much as the husband and I love this soup, he can seriously out eat us. When I was ready to take pictures of this, he had to sit with me eating a bowl while I took the pictures. A couple hours later when his dad came home for dinner he ate another huge bowl. Late night snack? You guessed it…another bowl! 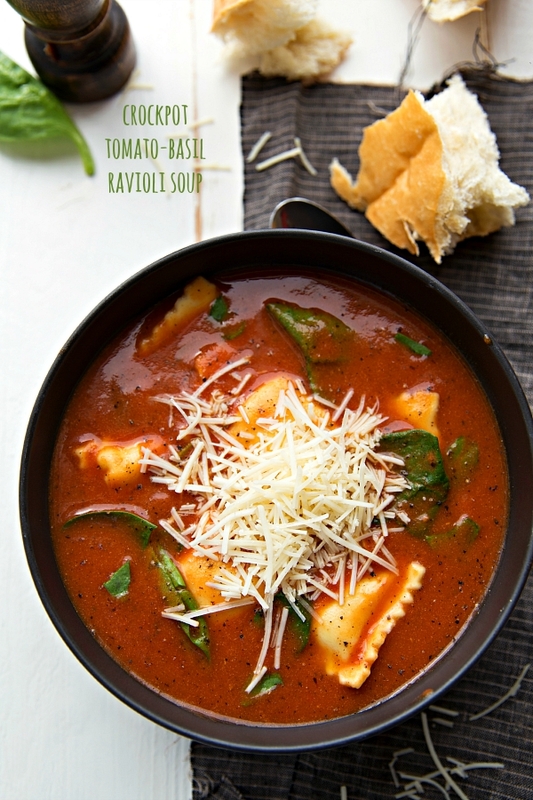 I was originally inspired to make a tomato-basil ravioli soup by a soup from a local sandwich shop called Kneaders. My sister used to work there and one time when we were over visiting my family she brought home a huge carton of their tomato-basil ravioli soup with some bread. The babe and I devoured it. Since then I’ve been craving it and new it was time to replicate the recipe! This one isn’t exactly the same and I added spinach to it (because I can’t NOT add some extra nutrition to a meal ever). Using roasted tomatoes (canned) gives you the flavor as if you’d spent the time to actually roast your own tomatoes. They add so much flavor with incredible ease! 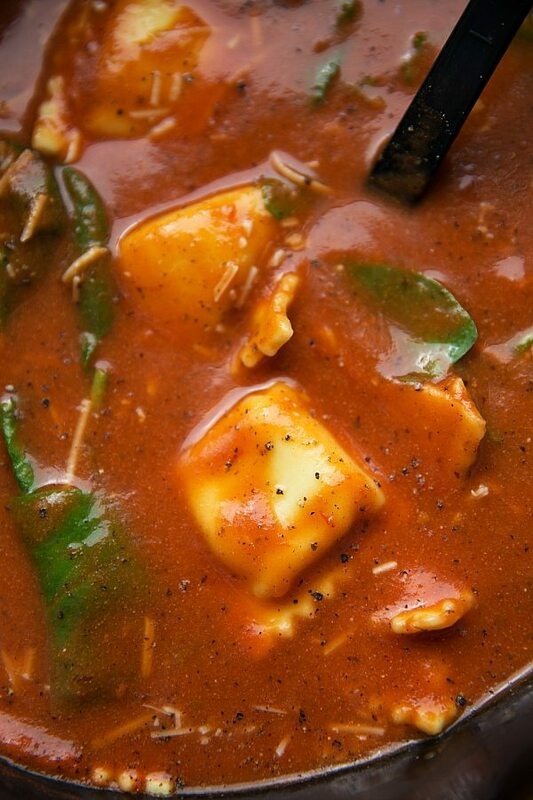 I made a note of this in the recipe, but this soup is pretty thick and hearty! If you like a thinner tomato basil base, it’s super easy to add in some more chicken or vegetable broth. Add additional broth to your personal preference. You may also want to slightly increase seasonings depending on how much extra broth you add. And the parmesan cheese on top? The best!! 2 cans (14.5 ounces EACH) fire-roasted diced tomatoes with seasonings the fire-roasted adds so much flavor!! 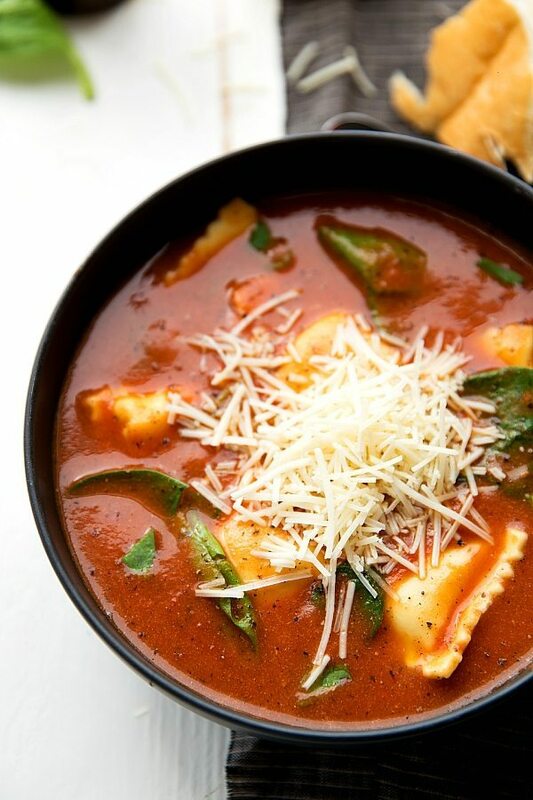 1/2 to 1 full package (25 ounce package) frozen 5-Cheese Ravioli minis if you can find it! Spray a large crockpot with nonstick spray. (The crockpot I use is 6 quarts). Pour in the cans of diced tomatoes (don't drain), tomato soup, and tomato paste. Add in the onion, garlic, sugar, basil, bay leaf, Italian seasoning, and chicken or vegetable broth (3 for a thicker soup, 4 for thinner). Cover and cook on low for 5-7 hours or high for 2-3-1/2 hours. Take out the bay leaf and then carefully transfer the mixture in batches to a blender or food processor. Season with salt and pepper and stir in the heavy cream. Add in the packed spinach and ravioli. (If you can find mini frozen ravioli's, use those). No need to cook the ravioli first. Cover the slow cooker and turn up to high. Cook for 10 minutes or until the raviolis are cooked through. 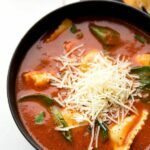 I prefer this soup really thick and each bite filled with ravioli, but you may like a thinner soup with less ravioli so add the ravioli slowly to your desired preference and add additional chicken or vegetable broth if desired. 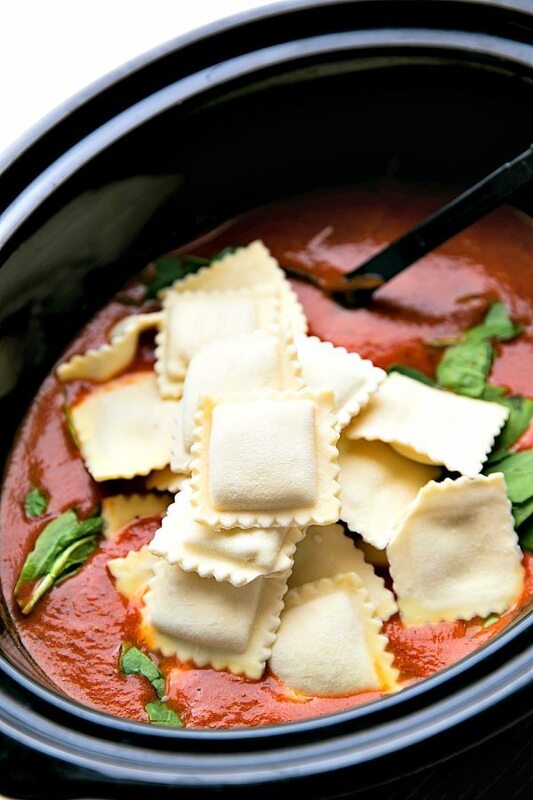 Top each bowl with Parmesan cheese and additional fresh basil if desired. Cook time varies on the temperature you use (low or high). Soup highly adapted from this Tomato Basil Recipe. Do you use thawed frozen spinach?? I have never made any kind of soup before from scratch until now. I made this for a group meeting and these ladies cleared the whole pot!! It was AMAZING!! Thank you for sharing!! LOVE hearing that! Thanks Audrey! This was sooooo good! Definitely making it again 🙂 I didn’t add spinach cause I didn’t have any. And I used fresh ravioli instead of frozen. but seriously, this is my new favorite soup.